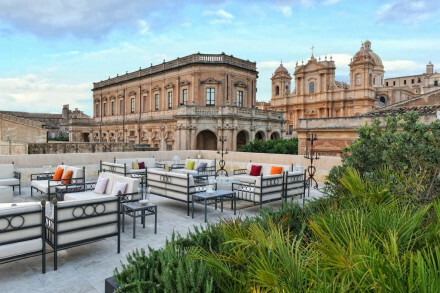 “The rolling hills of the Sicilian countryside just outside of Noto are a picturesque setting for this luxury hotel. 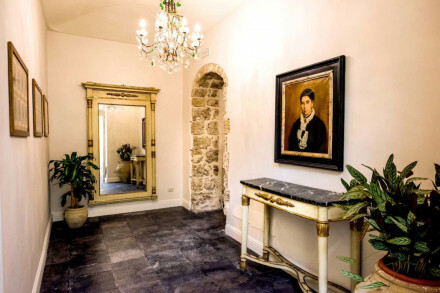 Nestled within a vineyard and plentiful citrus and almond trees are the hotel's three residences, with wistful, winding paths running between them. Guests can choose between private rooms or an entire suite with its own pool. Many of the rooms offer a verandah overlooking the verdant gardens and there is a large pool for communal use. Rooms are simply dressed in soft pastels with large windows, allowing the original heritage buildings and the natural surroundings to do most of the talking. The bucolic getaway is pretty much perfect, like its predecessor: It sits on a former winery, claiming 28 acres of gently rolling hillside, and is populated by organic olive, almond, and citrus trees.